Encontrei 88 Hotéis em Goyave. Escolha a data de entrada e saída para ver os hotéis disponíveis em Goyave. Sem informar as datas, os preços com (*) são preços médios de cada hotel e nos arredores até uma distância de 10 km. Featuring air conditioning, Les Fruits De Goyave offers accommodation in Goyave. Le Gosier is 13 km from the property. Free WiFi is available . Featuring a terrace, all units include a dining area and a seating area with a flat-screen TV. There is also a kitchenette, fitted with a microwave. Free private parking is also available on site. Bed linen is provided. LES FRUITS DE GOYAVE also includes a barbecue. Sainte-Anne is 23 km from Les Fruits De Goyave. The nearest airport is Guadeloupe - Pôle Caraïbes, 16 km from Les Fruits De Goyave, and the property offers a free airport shuttle service. Offering an outdoor pool, Gites VASSEAUX is located in Capesterre-Belle-Eau. Free private parking is available. The accommodation will provide you with a TV and air conditioning. There is a full kitchen with a microwave and an oven. Featuring a shower, private bathroom also comes with a bath or shower. You can enjoy sea view and mountain view from the room. The property offers guests that are booking more than 1 week a tour of the farm's operations. Carbet Falls, Reed Beach Alley, Dumanoir and Kassavarie are all within a 5-minute drive. This farm stay is 26 km from Guadeloupe - Pôle Caraïbes Airport. 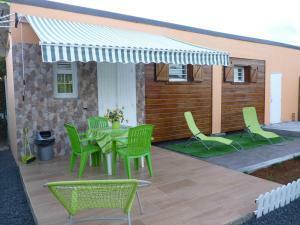 Offering free WiFi and a barbecue, KAZ A TI JO is set in Petit-Bourg. Le Gosier is 12 km away. Free private parking is available on site. All units feature a seating area. An oven and microwave are also provided, as well as a coffee machine. There is also a kitchen in some of the units, equipped with a toaster. Every unit has a private bathroom with a hairdryer. Bed linen is offered. KAZ A TI JO also includes a terrace. Sainte-Anne is 23 km from KAZ A TI JO. The nearest airport is Guadeloupe - Pôle Caraïbes Airport, 13 km from KAZ A TI JO. With an outdoor pool, Chez Nath is located in Petit-Bourg. This large guesthouse has an outdoor seating area and features free Wi-Fi and on-site parking. The rooms here feature bright décor and come with a seating area and a private bathroom with a shower and toilet. At Chez Nath you will find a garden and a bar. Guest also enjoy a quiet environment, with quick access to the sea, rivers, forest and towns. An array of activities can be enjoyed on site or in the surroundings, including hiking, diving and snorkelling. Pointe-a-Pitre International Airport in the capital city is just a 30-minute drive away. Gîte de Carangue Belle is located in Capesterre-Belle-Eau, a short 8-minute drive from Plage de Roseau beach. It features free on-site parking. 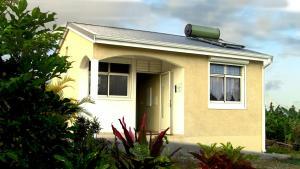 The bungalow here is air-conditioned and includes a full kitchen and a seating area with a TV. It overlooks the mountains and Caribbean Sea. At Gîte de Carangue Belle you will find barbecue facilities and a mini-market. Pointe-à-Pitre International Airport can be reached in 30 minutes by car. An array of activities can be enjoyed on site or in the surroundings, including hiking, diving and windsurfing. Located a 5-minute drive from Viard Beach, Guada Zen offers an outdoor pool and tropical gardens with a children’s play area and BBQ facilities. All accommodation includes a fully equipped kitchen. Each studio, bungalow and villa at Guada Zen features free WiFi, a flat-screen TV and garden views. Kitchens include a microwave and oven, while bathrooms come with free toiletries. Guada Zen is located 5 km from the centre of Petit-Bourg, and just a 25-minute drive from Pointe-à-Pitre and Guadeloupe International Airport. Free parking is available on site. La Créole Zen is a holiday home located in Petit-Bourg, 11 km from Le Gosier. The property boasts views of the garden and is 22 km from Sainte-Anne. Free WiFi is available throughout the property. The kitchenette features an oven and a microwave. A flat-screen TV is featured. Saint-François is 35 km from La Créole Zen, while Terre-de-Haut is 35 km from the property. The nearest airport is Guadeloupe - Pôle Caraïbes Airport, 11 km from La Créole Zen. The nearest bus stop is 200 metres away. Offering an outdoor pool and views of the mountain, Domaine de Villeneuve is situated in Petit-Bourg in the Basse-Terre Region, 14 km from Le Gosier. Sainte-Anne is 25 km away. Free private parking is available on site. The accommodation is fitted with a flat-screen TV with cable channels. Some units feature a dining area and/or terrace. There is also a kitchen, fitted with an oven, microwave and toaster. A fridge and stovetop are also available, as well as a coffee machine. Domaine de Villeneuve features free WiFi . Towels and bed linen are featured. Saint-François is 37 km from Domaine de Villeneuve. Guadeloupe - Pôle Caraïbes Airport is 14 km from the property. Featuring free WiFi throughout the property, Bienvenue Chez Nous offers accommodation in Petit-Bourg, 12 km from Le Gosier. Free private parking is available on site. Enjoy a cup of coffee or tea while looking out at the sea or mountains. Every room comes with a private bathroom equipped with a shower. The guest house also offers car hire. Sainte-Anne is 23 km from Bienvenue Chez Nous, while Saint-François is 35 km away. The nearest airport is Guadeloupe - Pôle Caraïbes Airport, 11 km from Bienvenue Chez Nous.